In observing people I’ve noticed that the capacity to be grateful is a mark of spiritual refinement. I don’t mean the capacity to express gratitude but to feel it. Think of your own experience when someone does something for you that you really appreciate. You don’t necessarily have to say, “Thank you,” but you feel love going out to that person that creates a link between the two of you. When I first met Ananda Moyi Ma, I had brought some messages for her from people in America. One was from a brother monk who had asked her for a bit of cloth — something she had used. When I asked her for this on his behalf, she gave it so gladly that I thought I’d better get in on the act, too. In America, of course we would, but in India, generally speaking, they don’t express thanks to their nearest and dearest because it seems too formal. The more typical Indian expression of gratitude is simply to offer their love in silence. I’ve noticed that sensitive people everywhere express gratitude this way. Whether or not they actually say, “Thank you,” is incidental. Try to expand your consciousness so that when you say, “Thank you,” what you mean is, “God, I love you and through your gifts I see how you love me.” The proper kind of gratitude isn’t for God’s gifts but for His love. The ability to feel and express appreciation deeply is not all that common. Often when you do people a favor, they act as if you owed it to them. It’s as though they don’t want to express appreciation for fear of being taken advantage of, or hurt. I’ve noticed in big cities, especially, that people are constantly hedging in their consciousness, for fear of being struck by an unkind remark. When you smile at them in a crowd, they look at you suspiciously, as if you were trying to put something over on them. Try to have the consciousness that says, “It doesn’t matter how I’m treated by other people; I just enjoy feeling and expressing love and appreciation.” What we give is ours to give and it shouldn’t matter how it’s taken. A mark of spiritual refinement is the willingness to give more than you receive, to remain open to others under all circumstances, and never to be afraid of what might come as a result. When you’re able do this, it’s a sign that you’ve developed enough inner strength that you no longer need to protect yourself. Only after we’re able to give real appreciation to God do we begin to understand that all gifts, good or bad, come from Him and that there’s nothing to be afraid of. In actuality, nothing is bad because the things that are painful always come for some important lesson or purification. Even the most unfortunate things prove in the end to be great gifts. Perhaps the loveliest story I’ve ever heard on this particular subject was from the book, The Hiding Place, by Corrie Ten Boom. Corrie and her sister, Betsy, were thrown into a concentration camp and put into a barracks-like room ridden with fleas. Betsy, who was a saintly soul, kept saying, even amidst the cruelty and deprivation of the camp, “We have to be grateful to God for everything.” Corrie was able to accept all the other hardships, but she simply couldn’t accept that the fleas were from God. A beautiful thing happened, however, when one day, they were holding a prayer meeting in their room with other women prisoners. Suddenly they heard the guards about to enter for an inspection. Betsy and Corrie became very frightened because they knew that if they were caught, they would all be subjected to severe punishment or even death. Just as the guards were about to go in, one of them paused at the door and said, “Let’s not go in there. It’s full of fleas.” And they moved on. The fleas were a minor inconvenience compared to the torture they would have been subjected to had it not been for those pests. Betsy quietly smiled at Corrie, who now understood that everything — even the fleas — were truly from God. When we can thank God for everything, then and only then do we really grow. If we thank Him for a beautiful dinner, then we should also thank Him for the times when we have no food at all. I’ve heard so many people say things like, “Oh, Master gave me a wonderful new car or apartment.” And I think, “You don’t really understand what Master can give you if you can get so excited about getting an apartment.” It may be that he gave you the apartment or it may be that it was just your karma. The point is that when people speak that way, they’re thinking in terms of the material blessings or comforts God gives, rather than of the lessons involved or the sweetness of God’s love. So let’s thank God for our blessings, yes, but let’s not define those blessings only in terms of good things. Let’s define them in terms of the opportunities that He gives us to grow and to deepen our love for Him. Very often, those who love God the most are subjected to the hardest tests. It doesn’t mean that he’s happy to subject us to tests, but he knows that our spiritual growth may require them. It’s like a doctor who subjects you to a painful operation to save your life. A child, not understanding the purpose of the operation, may scream bloody murder, but that doesn’t mean that the doctor would be more loving by not doing it. So it is with the guru: he would rather give us a little bit of pain now to spare us a great deal of suffering later on. You should be glad if God is asking more of you than of others, because that means you’ve shown a greater willingness to give. I learned long ago that the spiritual life is not defined in terms of what God is giving us but in terms of what we are willing to give — and to keep on giving — to Him. When you’re giving every ounce of your energy, you’ll be the one that He will call on to do more. Ask yourself, “Do I want to be a coward or a hero?”—because if you want to grow spiritually, you can’t be a coward. It’s not as if God were trying to strip us naked and ruin us. 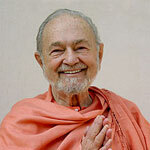 Rather, He’s trying to strip us of ego and attachment, so that we can relate to Him in a selfless, divine way. When you reach the point where you can say, “It’s all yours, Lord, my body, my possessions— you could take everything this moment and I’d never look back”— that’s when God gives you everything you could possibly want in return. We then find that our hearts are always filled with deep appreciation, and when we lie down in bed at night, we’re not just saying, “Thank you,” we’re simply enjoying God’s presence.